This topic has 21 replies, 10 voices, and was last updated March 4, 2018 at 3:50 pm by sscadmin. How to I get to the download area? 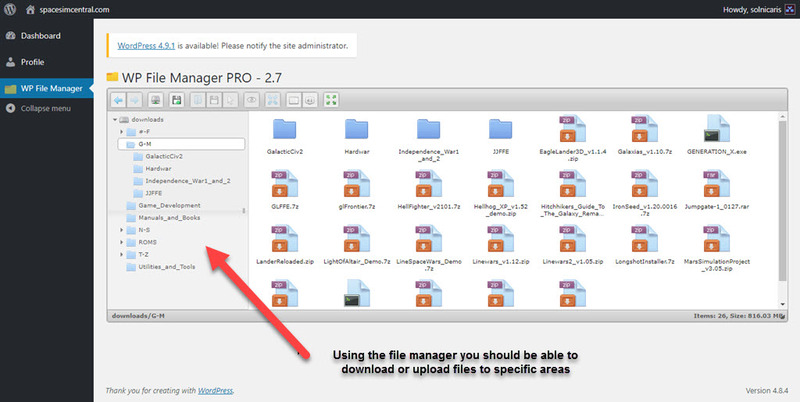 Currently, I am only allowing uploading and downloading permissions to files in this area. Since file renaming and folder creation can be exploited or used maliciously. I will probably make those sorts of privs available to trusted or donating members. Try to be descriptive in your filenames please when you upload and please stick it in the correct spot (ie: folder) to my knowledge you cannot directly link to files in the download area because I have security preventing it. Have any questions just let me know. Has anyone have any feedback on the download plugin in your profile? Is it working ok? How is the speed? Is uploading working for you all? Thanks. This has separate permission system from wordpress so I want to make sure everyone can use it without issue. Well, I have no “WP file manager” under my profile, I can only see “activity” “discussions” “inbox” “notifications” “comments”. Then there are some stats about me, and that’s it. Maybe I’m not looking at the right place ? > Well, I have no “WP file manager” under my profile, I can only see “activity” “discussions” “inbox” “notifications” “comments”. Then there are some stats about me, and that’s it. Maybe I’m not looking at the right place ? 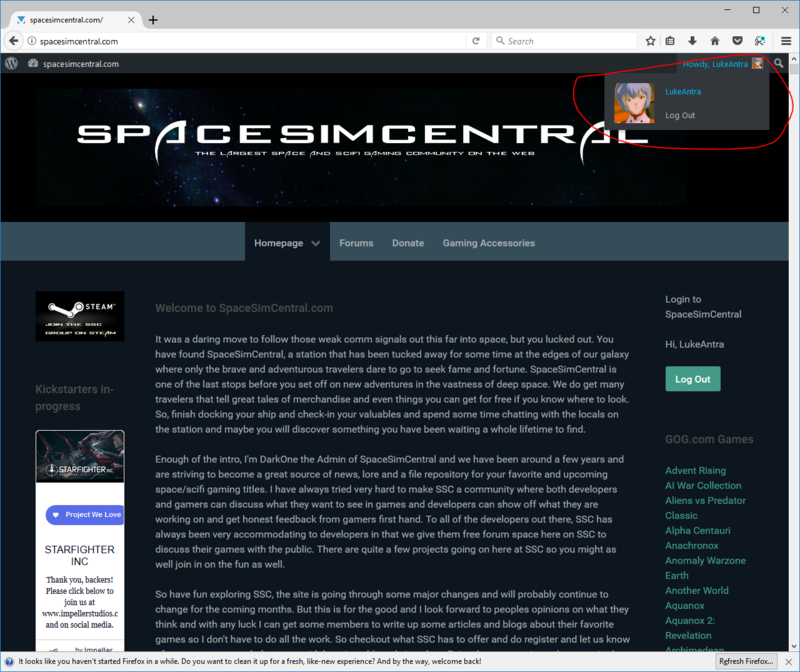 Go back to the wordpress side (http://spacesimcentral.com) and check your profile there. Working on the menu items in the forum area so they link back to correct locations. Thank you, silly me, I didn’t understand that “wordpress” refered to the non-forum part of site. speed seems to be good or at least better as downloading from my “OneDrive”. a little bareboned but well that makes no difference to the content. > a little bareboned but well that makes no difference to the content. I kinda wanted barebones in a way, the other was a lot to maintain with all of the versioning and descriptions/screenshots. And if people uploaded multiple versions and didn’t state in description it was tough to get the right one. Least this way everything is in alphabetical order and as long as people make decent file names the download area should run itself. The security seems decent so far as well, only one issue I need to remedy is the cap the plugin has on uploads I have to contact developer and ask how you up it to 2GB or more. Hmmm I think I read something about this in some pioneer threads. If you run as Administrator does this remove this issue? I wanted to say it was a Windows10 thing with a specific library. I would post in the Pioneer forums, or download from the Pioneer website since the one here might be old since I haven’t checked lately. It should be present in your profile, in the upper right corner of the screen (when your logged in). You will see your name, hover over this. Now just click your name. 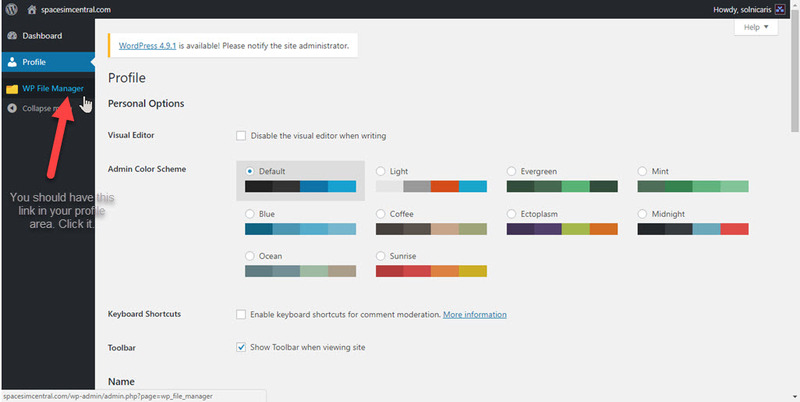 You should see a WP File Manager in the menu on the left, use that. I have altered some permissions today so just let me know if you cannot upload or download. Im either blind or something is broken because i cannot find the WP File Manager. 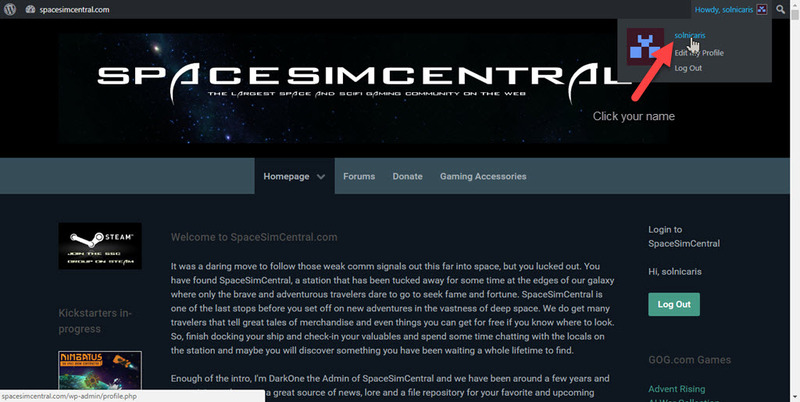 If i click on my name on http://spacesimcentral.com it just opens a dropdown menu with the option to log out. So when you click on your name top right corner (after logging in) and you enter your profile you don’t see your WP File Manager option on the menu to the left? Its there I have checked on my account and a test account, if you still not see it let me know and I will look into your permissions because no one else has said anything yet. I will try to make a screenshot soon so I can link it back to this post because its missing.. I actually cannot figure out how to enter my profile. In the red circled part, only the logout button does something. I’ve tried 3 browers (Chrome, FF and EDGE) and the behavior is the same in all 3.